I think Home Haruka can be considered an infamous Home staple, not because of the switch to Home style necessarily, but because it's a mask...frozen into a pretty creepy look. HOORAH! The schedule for iM@S live events is up! *2/7 live is a repeat of all the previous lives into one live show. Please set your PS3 clock to GMT Japan/Tokyo. Japan's time has a 26 hour work time, which is 2am. Awesome work. If it's off and you miss it somehow, kill h4ataraxia, not me. Be sure to pick up your light sticks and fan uniform at these stands too. Schedule is subject to change due to us being dumb and not doing it rite. 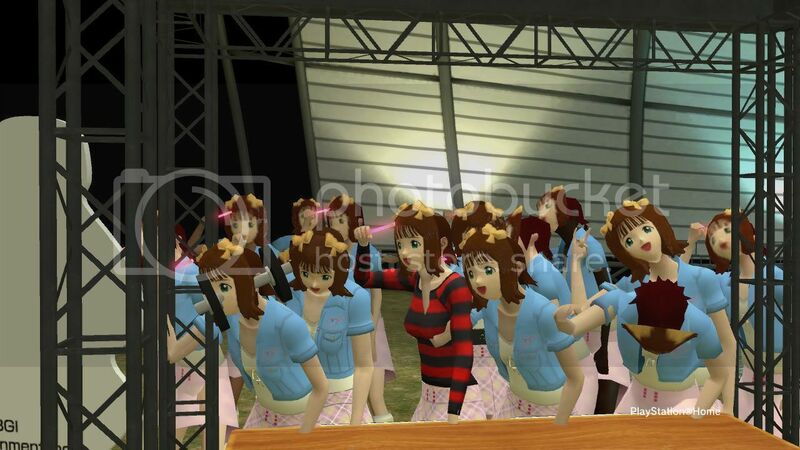 That's just the Haruka + Yukiho one. The Haruka + Chihaya one is... no where to be found...? at the moment at least. and at the live events. I WOULD LIKE TO GO TO THESE. Another Imas Live special video that Namco put up. Shows the fan stuff you collect and wear at the concerts in more detail. Are they not even having the 3 idols performing at the same time? o_o as a fan of duos & trios, I sense a disturbance with that. Yeah, that was me =3=, I was busy playing Mass Effect 2. Just got into the live right now, and so far Haruka has been doing colorful days and THE iDOLM@STER. Followed by iM@S SP's first trailer. Meh, wasn't there at the time, so I just recorded the thing. The 2nd show of the day started off with Haruka doing THE iDOLM@STER and ended with Colorful Days instead, dunno why they changed the order but meh. At the end they showed the trailer of Catalog 12 instead of the trailer. Once the people gets the hook on how to cheer, it's way more enjoyable. In today's last concert we triggered several appeals, and the second song was unexpectedly performed by Yukiho. Shiny Smile by Yukiho and THE IDOLM@STER by Yukiho and Haruka! Are there Niconico videos of this?